Friday night, April 6th 2018, a historic event took place at Marycrest manor Skilled Nursing home in Culver City. The first annual “Senior Prom” was held in conjunction with volunteer students from LMU. 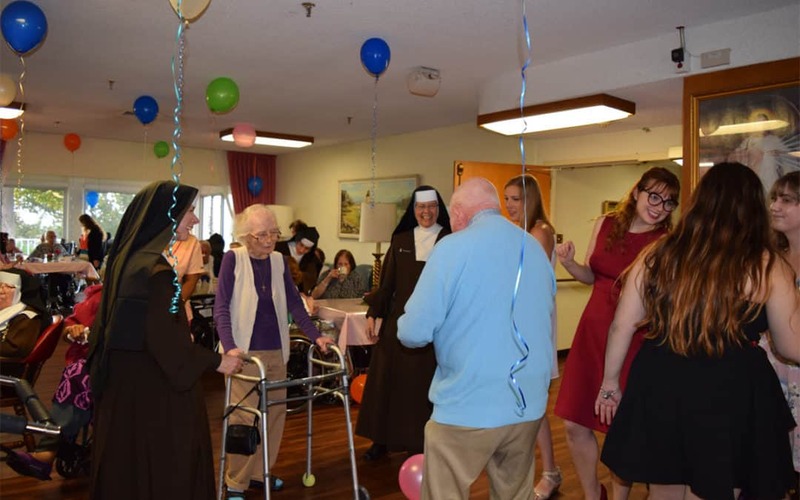 The students of the Gryphon and Ignatian Circle are regular volunteers who created this fabulous evening for our residents complete with a play list from the 30’s and 40’s top hits, balloons, and even a juke box! The staff of Marycrest worked hard with the students to set up for the prom early in the afternoon. By evening the dining room had been transformed into a ball room complete with dance floor and a photo booth for perfect prom pictures. The dinner meal was served and even one of our doctors came and played live music for the residents on his guitar. The Carmelite Sisters arrived shortly after dinner and the dancing began! Residents and students engaged in a lively exchange of joyful wholesome fun. The residents reminisced about the dances of long ago, and some were even able to teach the students some “new moves” from the classic swing era. Some family members that joined us were in awe of the way that their loved ones revived in spirit when they heard the music and started to dance as well. It was a sight to behold our prom king and queen, Steve and Agnes, who have been married for 69 years and who moved into Marycrest Manor last month. Truly it was a blessed evening of joy, fun, reminiscing, and bringing to our residents that fullness of life that Christ our Lord promises. The students enjoyed hosting the event so much that they hope to do it every semester. We look forward to seeing you at our next dance!